During the MVP Summit we gathered in the hotel and had recorded one of the discussions that went there. It was hilarious, and now it is online. Listen to the interview war stories, and check the bit in the end. Nathan has posted Simple State Machine to CodePlex, it is the first project that I am aware of that uses Rhino DSL and the techniques that I am talking about in the book. What is impressive about this is the level of professionalism that is involved in the project. It is a full scale DSL, with all the supporting infrastructure. I spent half an hour or so going through the entire thing, and I am impressed. Put simply, this is how I think state based work flows should be defined. 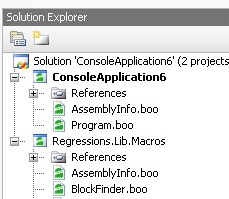 I could easily see myself extending this a bit to add persistence support & integration with NServiceBus, and be done with it. Like most state machines, it has the ideas of states, events that can cause the state to be changed, and legal transitions from state to state. You can define tasks which will be executed upon changing a state, or upon entering / leaving a certain state. #Event & State Identifier Targets. #to resolve Event or State names into strongly typed CLR objects. #the state machine to Complete when they are reached. 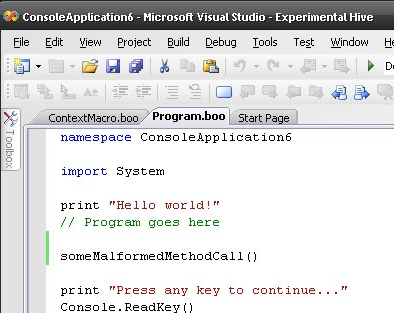 A few days ago, the BooLangStudio was announced in the Boo mailing list, bringing Boo support into Visual Studio. Below you can see several screen shots. And you can find out more about it here. Of course, this is still very early in the game, but it is good to see progress in this area again. It took me two months to write 5 pages, then I started from scratch and wrote the whole chapter (~30 page) in two days. Reading is so much harder than writing. I went over what I wrote so far, and it is painful. I am considering having a language that mandates tests. If you don't have a matching test for the code in question, it will refuse to run. If the tests fail, it will refuse to run. If the tests takes too long, they are considered failed and the code will refuse to run. This certainly ensure that there would be test. It wouldn't ensure that they would be meaningful, however. That is fine by me. I am not interested in policy through enforcement, just gentle encouragement in the right direction. The technical challenges of implementing such a system are nil. The implications on the workflow and ease of use for such a system are unknown. On the surface, checked exceptions are great. In practice, they are very cumbersome. This is why I am warning that I have only toyed with the idea, not implemented it. SciFi Inflation is the best term that I can use for this book series. It was engaging enough for me to go through all three books, but it bothered me enough to put a negative post about it. Just about anything in those books is over-inflated. Interstellar travel times are measured in minutes, thousands of sentient races exists, sensors that can read the details of a ship from thirty light years away, an interstellar power has 300 million ships, etc. This is like nails on board, highly disturbing for the flow of the story. And the story is good, it is just that those are beyond "wavehand physics away", I expect that. But I expect that to be done in a believable way. Case in point, at one time the ship just blew up a few other ships, and it was hit with a bit of debris. The command that the Captain gibes? "Pilot, takes us half a light year out, I want to have a little time to respond if something like that happen again." Does the author have any idea about how big a light year is? Or, as I like to call them, yes another stupid language limitation. I did some work today on Rhino Mocks, and after being immersed for so long in DSL land, I had a rude awakening when I remembered just how much inflexible the C# language is. Note that unlike my other challenges, I have no idea if this is possible. I am posting this after I got fed up with the limitations of the language. when I am writing DSL, I keep hitting one pain point. The CLR naming conventions, which are more or less imprinted on my eyelids, are not really conductive to clear reading in a DSL. This is much easier to read, in my opinion. The problem is that I consider this extremely ugly. /// Allow to use underscore separated names, which will be translated to pascal case names. /// All names that contains an underscores will go through this treatment. /// Sets the node name to pascal case. I love Boo, with cause. CanCompile - This is the most trivial test, it assert that I can take a known script and compile it. Syntax tests - Didn’t we just test that when we wrote the CanCompile() test? When I am talking about testing the syntax I am not talking about just verifying that it can compile successfully. I am talking about whatever the syntax that we have created has been compiled into the correct output. The CanCompile() test is only the first step in that direction. Here is an example of such a test. DSL API tests - What exactly is the DSL API? 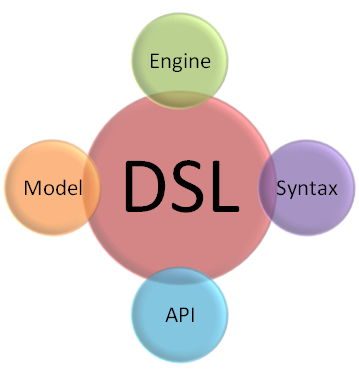 In general, I think about the DSL API as any API that is directly exposed to the DSL. The methods and properties of the anonymous base class is an obvious candidate, of course. Anything else that was purposefully built to be used by the DSL also fall into this category. Those I test using standard unit tests, without involving the DSL at all. Testing in isolation again. Engine tests - A DSL engine is the responsible for managing the interactions between the application and the DSL scripts. It is the gateway to the DSL in our application, allowing us to shell out policy decisions and oft-changed rules to an external entity. Since the engine is usually just a consumer of the DSL instances, we have several choices when the time comes to create test cases for the engine. We can perform a cross cutting test, which would involve the actual DSL, or test just the interaction of the engine with the provided instances. Since we generally want to test the engine behavior in invalid scenarios (a DSL script which cannot be compiled, for example), I tend to choose the first approach. We have talked about how we can create tests for our DSL implementation, but we still haven’t talked about how we can actually test the DSL scripts themselves. Considering the typical scenarios for using a DSL (providing a policy, defining rules, making decisions, driving the application, etc), I don’t think anyone can argue against the need to have tests in place to verify that we actually do what we think we do. In fact, because we usually use DSL as a way to define high level application behavior, there is an absolute need to be aware of what it is doing, and protect ourselves from accidental changes. One of the more important things to remember when dealing with Boo based DSL is that the output of those DSL is just IL. This means that this output is subject to all the standard advantages and disadvantages of all other IL based languages.In this specific case, it means that we can just reference the resulting assembly and perform something write a test case directly against it. Note that creating a test DSL is only worth it if you expect to have a large number of DSL scripts of the tested language that you want to test. How do I test the syntax in this DSL? HandleWith should translate to a method call with typeof(RoutingTestHandler) and a delegate. Well, I use interaction based testing, obviously. I find this test utterly fascinating, because it is fairly advance, in a roundabout sort of way, and yet it is so simple.